Speaking to shareholders at the company's Annual Meeting on Friday, Apple's chief executive Tim Cook joked that he kept himself up to date on the progress of his Campus 2 "Spaceship" project by watching drone videos posted on the Internet. For Cook and everyone else that's interested, here's the latest progress update on Apple's new innovation center. Back in January, a drone video showed massive glass panels being installed, the largest on earth. In October, the entire ring was just beginning to take shape. Today, most of the glass has been installed and the entire Spaceship ring structure has topped out, and the roof top's HVAC (Heating, Ventilation, and Air Conditioning) equipment is being covered with plates (appearing blue in the video) that will hold vast solar photovoltaic panel structures that will likely make the project the largest corporate solar structure in the U.S. The distinctive Campus 2 project is so large it can be easily spotted from aircraft, as shown in our March update video (above). Also clearly visible is the project's grand cafeteria area with a dramatically high ceiling, the first segment of the structure to begin rising back in March of 2015, just one year ago. Also depicted are the white fin-like sun shields that will ring the building at each floor level. The structures also function as part of the building's fresh air ventilation system, which will enable it to run without heating or air conditioning throughout most of the year, taking advantage of the very comfortably mild weather that blesses Cupertino, California. Granted final approval just two years and four months ago, Apple's Campus 2 project is rapidly moving toward its initial occupancy goal beginning in January 2017, slightly later than originally expected. Cook also noted to shareholders on Friday that project's 1000 seat theater might open in time to host next year's Annual Meeting, if everything goes according to plans. Apple's cofounder Steve Jobs unveiled the huge project in 2011, noting that the central 2.8-million-square-foot "Spaceship" structure would house at least 12,000 employees, surrounded by bucolic landscaping including orchards of fruit trees and other greenery, featuring open space and walking paths to reclaim most of the 150-acre plot previously covered by asphalt parking lots. Next to the center of Campus 2, Apple's parallel Phase 2 project is also well underway, adding additional office space, workshops, research and development labs and incorporating a small data center powered by renewable energy. See previous coverage on AppleInsider of Apple Campus 2 and the current Infinite Loop headquarters, or our other articles on drones. Viewers interested in the DJI Phantom 2 Vision+ drone can read more about the device here. Or as US government officials refer to it from surveillance satellites and drones - the Bullseye Campus. As someone who takes in interesting in architecture I'm highly looking forward to the completion of this project. I imagine it'll be a highly influential architectural achievement. They need a small train or something that loops around the building that people can hop on and off of. Can you imagine being on one side, and having to walk all around to the other side then back again, or having to cut though the middle. The place looks huge. I would love to see a "Making of" video. That takes us from the beginning to the completion. Would be extremely fascinating. Yes a narrow gage steam powered train would be really cool. Of course being Apple they would ignore histroy and install a modern robotic rail based system powered by laptop batteries. Either way I do think that even Apple has underestimated how much of a problem navigating the reservation will be. I understand there will be bicycles available to help with this issue. I like bicycles but they aren't always the ideal solution. I do wish that they would get rid of the polluting busses though. 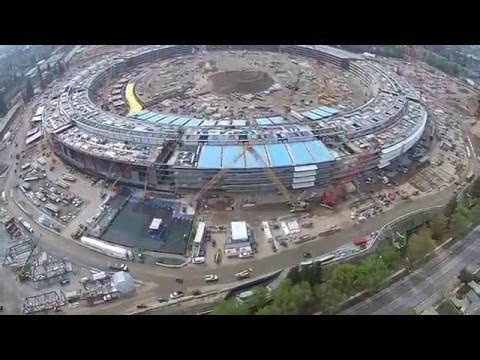 The music with the March 2016 video of the Apple campus is terrible. Please return to the music used with the initial videos of the campus. It was classy, fun, unique and music, not goofy sounds. variety is the spice of life. it didn't bother me. in fact, i found it enhanced the dramatic impact of the construction and progress. Most people who work on a project will be in proximity, so this won't be an issue. A lot of the people in this building used to be in different buildings far away, so a short walk is a big improvement. ^^^ Realism! Don't see much of that around here lately. I agree, and I hope you're right about the last point. Anyway, the real March video is on youtube (also showed up on MacRumors). It's actually the best video so far, more interesting things to see, and all captioned. Very nice. All this talk about traversing this enormous space! Apple is a tech company that will likely make face to face interactions less necessary, still, what could be a more healthy environment than one that ENTITLES an associate to walk instead of sitting on their keisters. Healthy body, healthy mind, and visa versa. Steam powered? What heats the steam? Perhaps CNG or LNG or even Redeem from waste sites. Much cleaner than any other fossil, and much more power than battery. Those huge blue panels look a little like SIPs - Structural Insulated Panels. Although of course, built in Apple's own special way. Damn this thing is going to be freakin' cool when completed. I'm so excited! Also, it's really stunning to me, as I'm not nor have I ever been involved in construction of any kind (Legos don't count, right? ), how quickly something this huge and complex is being completely. It kind of blows my mind! You mean "Out of the Blue"
Growing up, ELO was my favorite band. I had almost all the vinyl!! I live in Tokyo and teach English at Apple HQ here. Californians drive everywhere. People in Tokyo WALK. It's good for you. Californians have to be able to swiftly exfiltrate from gangs. The Yakuza, at least, still has a little bit of class.